Joseph Huston, the son of a Philadelphia carpenter, was a young man determined to make his mark on the world. At age 13, he left school to apprentice with a sign-painter. He soon realized, however, that architecture was his true calling. In 1883, he entered the architectural firm of Furness & Evans, where he stayed for five years. In his free time, Huston studied Latin, Greek, and mathematics with a tutor, enabling him to enter Princeton in 1888. At Princeton, Huston's closest friends included architect Frank A. Hays, painter Edward Redfield, and sculptor Alexander Stirling Calder. Most likely, it was this circle of artistic friends that first led Huston to consider the integration of architecture, painting and sculpture in a single project: Ideas that manifest in the Pennsylvania Capitol. Upon graduation, Huston traveled to Europe, where he became enraptured with the edifices of the Italian Renaissance, in particular, St. Peter's in the Vatican. Every day, he would walk to the church to sketch and dream of one day building a structure modeled after the likeness of beauty he beheld in that great Renaissance basilica. Despite his youth and relative inexperience, the Capitol Building Commission chose Huston as the winner of the 1901 design competition for the new Pennsylvania Capitol. The new Capitol was to be, essentially, a completion of Henry Ives Cobb's brick structure, begun in 1897. From the outset, it was the intention of Huston and the Commission to create a magnificent structure incorporated with a rich program of fine and decorative arts. 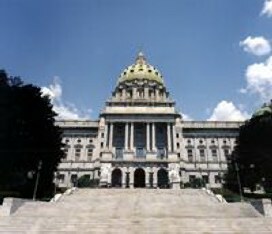 Huston intended to make the Pennsylvania Capitol a monument to the new Renaissance, an example of architect, painter, and sculptor working together in harmony toward a single goal. Huston's grand scheme was an overwhelming success. On the day of the Pennsylvania Capitol's dedication, October 4, 1906, President Theodore Roosevelt exclaimed as he stepped inside the entrance, "This is the handsomest State Capitol I ever saw." Those sentiments are still expressed today and stand in tribute to the man who dared to dream. 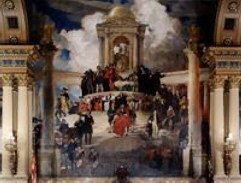 In 1902 Pennsylvania Capitol architect Joseph Huston asked Oakley to paint 13 murals for the Governor's Reception Room. Huston believed that choosing Oakley would "act as an encouragement of women and the State." 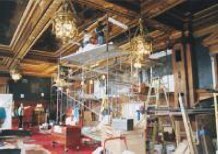 In fact, the Capitol project signified a milestone in the history of American art, for it was the largest public commission given to a woman in the country up to that time. In addition, it allowed Oakley to transcend the conventional roles of women painters as either portrait or genre painters, and to pursue a successful career in the prestigious, but overwhelmingly masculine, field of mural decoration.